Mary Ellen has had an interest in art since childhood. 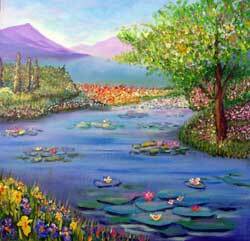 She is a genuine lover of color, and this is evidenced in every one of her paintings. 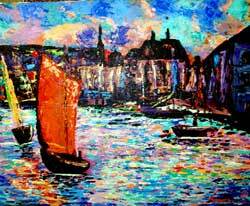 She paints in a sensitive style of impressionism, reminiscent of her favorite painter, Claude Monet. She is a native of Pennsylvania and has also lived in California and Texas where she pursued her dreams, completing her education in Interior Design with minors in Art. She moved with her husband Jess and children Howard and Laura to Dhahran, Saudi Arabia, where she lived for 25 years. Jess was employed by Aramco. While overseas, Maryellen designed many prominent homes and was the official company hostess for visiting foreign diplomats and royal families, as well as for local business executives. Mary Ellen has attended art workshops in England, Spain, Italy and France. She is currently under the tutelage of Len Mykietyn, an accomplished artist and owner of the Angilen Gallery in Tequesta, Florida. In addition to her beautiful paintings, Mary Ellen has been designing greeting cards, along with other art forms, since 1970. Her creations remain in homes throughout the United States as well as overseas. See more art by Mary Ellen Arceneaux. 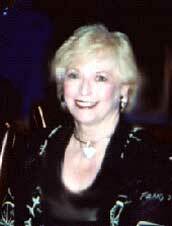 Mary Ellen also applies her creative talents as an Interior Designer in Florida. She would like to offer all Aramco ExPats, including Aramcons, former Aramcons and Annuitants, discounts on home furnishings and floor plan designs. She may be reached at (561) 575-1593 or by email at [email protected]. Inquiries may be sent to 10459 S.E. Silver Palm Way, Tequesta, Florida 33469 or faxed to (561) 748-8615.